AUSTIN — For the third time since the founding of the Tom Joyner Foundation in 1998, Huston-Tillotson University earns the distinction of Tom Joyner “School of the Month” for May 2019. Despite being five months away, the benefits of the honor start now. Supporters can donate at htu.edu by clicking on the Tom Joyner Foundation scrolling banner, at tomjoynerfoundation.org/donate, or text GrowHBCUS to 41444. The Tom Joyner Foundation was founded by its namesake, Tom Joyner. Joyner earned the nicknames, “The Fly Jock” and “The Hardest Working Man in Radio” by working long hours and flying between his morning job in Dallas and afternoon job in Chicago every weekday for eight years, collecting over seven million frequent flyer miles, according to the Tom Joyner Show’s syndicated radio station, Jacksonville’s Hot 99.5 FM (The nearest syndicated station to Austin is My Kiss 103.1 in Copperas Cove, Texas.). The School of the Month campaign is the Foundation’s premier fundraising campaign. Each year, the Foundation selects several HBCUs as its School of the Month partners and works together with best practices to raise funds for the schools’ designated months via every avenue possible, including, but not limited to, alumni, corporations, foundations, special events, and social media. 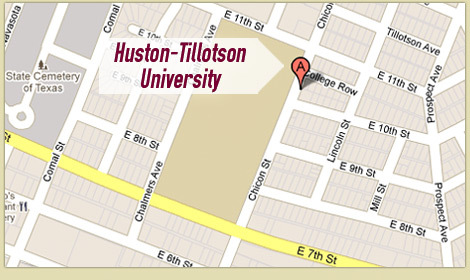 Huston-Tillotson applied for the honor this summer. As a selected school, the Tom Joyner Morning Show will promote Huston-Tillotson and raise funds from its over 10 million listeners, alumni, and other interested parties during May 2019. The show airs in over 90 markets. The Tom Joyner Foundation (http://tomjoynerfoundation.org) was founded in 1998 as the brainchild of nationally syndicated radio personality Tom Joyner. The mission of the Foundation is to support historically black colleges and universities (HBCUs) with scholarships, endowments and capacity-building enhancements. The Foundation has provided necessary support to every HBCU in its 19-year history to help sustain and preserve the legacies of these valuable institutions. Through fundraising and donor development initiatives, in excess of $65 million has been raised to support more than 29,000 students attending HBCUs. Additionally, the Foundation has recommended internships, offered matching grant support, and career development to deserving students.